Make room for a new dance show in your television lineup. King of the competition series Simon Cowell (he's behind hits like "The X Factor" and "America's Got Talent") is said to be working on a new project just for dance fans: "The Greatest Dancer." The Telegraph reports that Cowell's show is expected to replace "Strictly Come Dancing" (the UK version of "Dancing With The Stars"), and will feature dancers from every genre. In the dance world, Mandy Moore has long been a go-to name, but in 2017, the success of her choreography for La La Land made the rest of the world stop and take notice. After whirlwind seasons as choreographer and producer on both "Dancing with the Stars" and "So You Think You Can Dance," she capped off the year with two Emmy Award nominations—and her first win. You've come a long way on "So You Think You Can Dance"—from assistant to the choreographer (Season 1) to creative producer (Season 14). What keeps you returning to the show? "So You Think You Can Dance" was one of my first jobs, so it feels like home. I love the chaos of live television; as soon as one show is over you're on to the next. J.T. and Robert perform Travis Wall's "The Mirror" on "SYTYCD" season 13. No, you didn't miss the Emmy Awards telecast. (It's next weekend.) The Creative Arts Emmys, on the other hand, were awarded yesterday, including the Emmy Award for Outstanding Choreography. Among the nominees were "Dancing With the Stars" favorite Derek Hough, "So You Think You Can Dance?" contestant-turned-choreographer Travis Wall, surprise contender Fred Tallaksen for comedy "The Real O'Neals" and commercial dance juggernaut Mandy Moore, who grabbed two nominations for both "DWTS" and "SYTYCD." From salsa to the waltz to the Lindy hop, "Dancing with the Stars" has brought 22 seasons of ballroom into viewers' living rooms. While we admit that it's fun seeing celebs show off a newfound skill (like Olympic gymnast Shawn Johnson in this Lindy hop routine from a few years back), sometimes the most entertaining—and dare we say skillful—ballroom can be found by digging into the past. Though you may not immediately know his name, chances are you've seen Frankie Manning dance. Not only is he the subject of today's Google doodle, but the dancer and choreographer, who would have been 102 today, has been crowned by many as the ambassador of Lindy hop. Frankie Manning in 1989. Photo by Bill Cunningham, via nytimes.com. 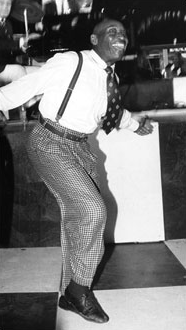 Manning (1914–2009) was a key figure in the popularization of the energized, rhythmic, thrill-seeking genre and a dynamic fixture at Harlem's historic Savoy Ballroom. He also choreographed and appeared in many movies in the 1930s and '40s, including Keep Punching, Hellzapoppin’ and Killer Diller. So where have you seen Manning and his work? Surprisingly enough, on Facebook and YouTube. For the last few years, I can't tell you how many times this clip has popped up on my feed after it was shared by dancers and non-dancers alike. Admittedly, I watch it Every. Single. Time. And it never gets old. This Lindy hop scene from 1941's Hellzapoppin' was created by Manning (although he went uncredited), and you can catch him dancing at the 1:22 mark. Before you ask, no, the video playback has not been sped up. The way the dancers attack each lift and turn is unabashed—talk about trusting your partner. And the accelerated footwork and use of momentum are downright impressive. After you pick your jaw up off the floor, read more about Manning's spirited style and incredible legacy in these stories from our sister publication Dance Teacher. Happy birthday, Frankie Manning!